Dodrio in game: 544 Who? Important notice! Pokemon Dodrio is a fictional character of humans. 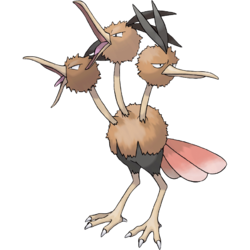 Dodrio is a large, wingless, three-headed avian Pokémon. Each head has a long, sharp beak and a black feathered, V-shaped crest. It has bristly brown feathers covering its heads and upper body, while its lower half has a smooth layer of black feathers. Its wingless body rests on two long and slender, but powerful legs with feet that have three toes in front and one in back. There are sharp claws on each toe. Males have black necks, whereas females have brown necks; both genders have brown legs. Each head has its own working brain and distinct personality, representing and expressing sorrow, anger and joy respectively. Despite being separate, it has the innate ability to use all three of its brains to collect data, formulate and then execute complex plans and strategies. However, on occasion it may over think and analyze a situation, causing itself to be immobilized and unable to carry out any action whatsoever. Being separate individuals on the same body, the heads are well known to squabble with one another. Often they will continue to bicker until they, or at least one of the heads gets to eat. This satisfies the other two heads, quelling them and temporarily ending their infighting. Another adaption it has acquired is the ability to have at least one head alert at all times. While two are asleep, one will stand guard and look out for any approaching enemies. Extreme caution is advised when all three heads are facing separate directions. It is in this state that it is the most dangerous, and going near it may result in a severe pecking. Dodrio's first major appearance was in The Flame Pokémon-athon!. Dario used the three-headed bird to compete in a race, but was beaten by Ash who was riding Lara Laramie's Ponyta, after it evolved into Rapidash. Falkner, the Gym Leader of Violet City, used a Dodrio to battle Ash in Fighting Flyer with Fire. 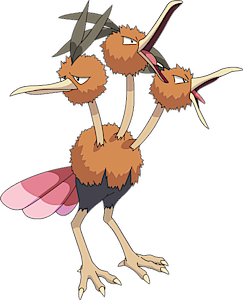 Dodrio served as mounts for the Diglett thieves in the episode, Plant It Now...Diglett Later. A group of Dodrio were used in Pokémon Ranger and the Kidnapped Riolu! Part Two by Ash, Kellyn, Dawn and Brock to get to the Riolu that J had kidnapped. Dodrio first appeared in Pokémon - I Choose You!, where it has a brief appearance, while shouting its cry to the rising sun like a rooster, notably as the first Pokémon seen in real life in the anime (all Pokémon that had appeared beforehand in the episode were either on TV, in dreams, or not real). Dodrio also appeared in Primeape Goes Bananas and The March of the Exeggutor Squad. A Dodrio also appeared in Pokémon Fashion Flash. Dodrio also made a cameo in A Chansey Operation. 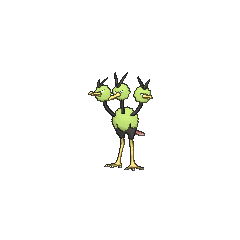 This Dodrio had its necks tied in a knot. A Dodrio under the ownership of Stella appeared in It's Mr. Mime Time. Dodrio made an appearance in Make Room for Gloom. 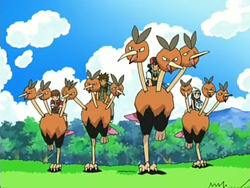 Tracey was seen riding a Dodrio in a flashback in The Lost Lapras while Pokémon watching. However, it is unknown whether Dodrio belonged to him or if it was simply borrowed. 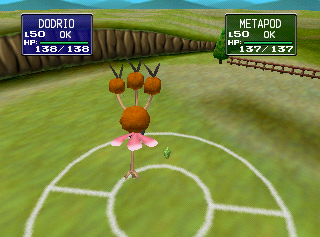 A pink Dodrio appeared in In the Pink. Dodrio also appeared in The Power of One. A Dodrio appeared in Beauty and the Breeder where it participated in a Pokémon breeding competition. 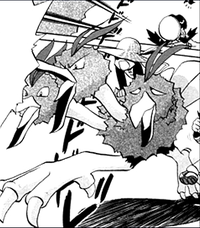 In Extreme Pokémon!, a Dodrio appeared with its Trainer, participating in the Extreme Pokémon Race. Candice used a Dodrio in A Pyramiding Rage!. 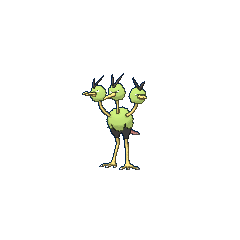 A group of Dodrio also appeared in Historical Mystery Tour!. A Dodrio appeared in A Race for Home!. Multiple Dodrio appeared in From A to Z!. Red used a Dodrio in File 4: Charizard in the Pokémon League. In Just a Spearow Carrier Professor Oak, under the guise of Dr. O, used a Dodrio in his Battle against Green in the semi-finals to provoke her fear of birds. 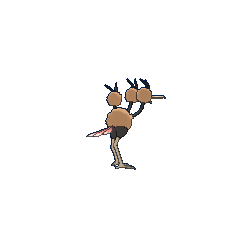 Yellow's Doduo evolved into Dodrio in The Might of... Metapod?! in the battle against Lance. It was seen again, managing to save Pika and Chuchu from a surfing accident. It continues to be her main method of transportation using its quick speed. 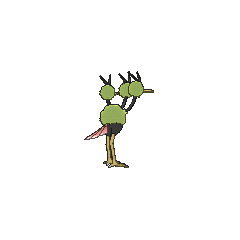 A Dodrio appeared in The Last Battle XIII as one of the Pokémon sent to help the fight in Ilex Forest. In Out-Odding Oddish, Jet, a notable competitor in the Pokéathlon's Speed Course, used a Dodrio to compete with Gold. Dodrio's National Pokédex number is the whole number portion of its weight in kilograms. As of Generation V, this is a unique characteristic. However, Slowpoke and Scyther share the distinction when considering their respective weights in pounds.